The Key to Living Well? 4“Abide in Me, and I in you. As the branch cannot bear fruit of itself unless it abides in the vine, so neither can you unless you abide in Me. 5“I am the vine, you are the branches; he who abides in Me and I in him, he bears much fruit, for apart from Me you can do nothing. 6“If anyone does not abide in Me, he is thrown away as a branch and dries up; and they gather them, and cast them into the fire and they are burned. 7“If you abide in Me, and My words abide in you, ask whatever you wish, and it will be done for you. 8“My Father is glorified by this, that you bear much fruit, and so prove to be My disciples. 9“Just as the Father has loved Me, I have also loved you; abide in My love. 10“If you keep My commandments, you will abide in My love; just as I have kept My Father’s commandments and abide in His love. 11“These things I have spoken to you so that My joy may be in you, and that your joy may be made full. When it comes to exercise many of us ask: “How long will it take?” or “How much do I have to do?” The shorter the duration the better, we hope. Scientists at McMaster University in Hamilton, Ontario have researched the benefits of shorter-duration, high-intensity workouts. They found that the aerobic benefits were just as high as those who had worked out for much longer periods of time. (1) As one professor noted, “If you are someone, like me, who just wants to boost health and fitness and you don’t have 45 minutes or an hour to work out, our data show that you can get big benefits from even a single minute of intense exercise.”(2) This is good news for all who feel there are not enough hours in a day. Yet, as good as this news may be for some, I am increasingly nervous about all the schemes and strategies to make one’s life more efficient. From the One Minute Manager to the One Minute Workout the short-cutting of our lives appears endemic. If one needs a quicker, faster, shorter version, there is an app for that. But I worry about what happens to our aptitude for endurance in the elevation of the efficient? 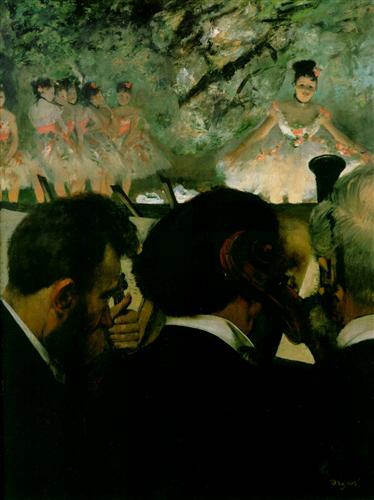 Edgar Degas, Musicians in the Orchestra, oil on canvas, 1872. By contrast, author Malcolm Gladwell argued in his book Outliers that ten thousand hours of deliberate practice are needed before one can become good at some things. He cites Mozart, Bill Gates, and the Beatles as examples of brilliant artists and inventors whose patient practice and discipline began at an early age. (3) In fact, many artists suggest that their creative expression is something that must be practiced—exercised, as it were, just like any muscle. Significant achievement—in any area—is realized when bounded by discipline, and a tireless commitment to practice, routine, and structure. The painter, Wayne Thiebaud, once said that “an artist has to train his responses more than other people do. He has to be as disciplined as a mathematician. Discipline is not a restriction but an aid to freedom.”(4) Sadly, Thiebaud’s and Gladwell’s views are often the minority report in our hurried age. Assumptions about growth in the spiritual life often parallel these assumptions about efficiency. Often, the drive to see measurable results creates unrealistic expectations. We often want a One Minute Spiritual Life that still yields unbounded growth and instant transformation. We expect the constant flow of “good feelings” surging through us. If we do not experience these things, or if we don’t perpetually experience something novel and instant from the rhythm of worship, prayer, or study, then we believe that something isn’t right. Sadly, we eschew the repetitive nature of discipline and routine. There are not three easy steps to a vital spiritual life, nor an efficiency guide to greater transformation. And in his life and ministry, Jesus makes this connection between growth and discipline. In the gospel of John he exhorts his followers to “abide” in him—literally to rest and to take nourishment from the life Jesus offers. (5) Rest is the opposite of the efficient. In addition, he describes abiding in terms of love and obedience. “Just as the Father has loved me, I have also loved you; abide in my love. If you keep my commandments, you will abide in my love; just as I have kept my Father’s commandments, and abide in his love. These things I have spoken to you, that my joy may be in you, and that your joy may be made full.”(6) Jesus insists that joy flows from a life of discipline and obedience that includes keeping his commands. They are not separate endeavors, but intimately enjoined to produce abundant life. How ironic this statement seems when most of us do not associate joy with discipline or endurance! Our daily living often feels like monotonous routine. We can understand the desire to find a short-cut that brings excitement or instant results. But joy cannot be reduced to a feeling, nor is it dependent on the whims of our personalities. Joy is the result of a life lived in the rhythm of rest, routine, and discipline. Following in the way of Jesus can sometimes feel both tedious and difficult, as surely it is both tedious and difficult at times. But disciplined obedience is not a blockade to fullness of joy, but rather a doorway that opens into the abiding presence of God. There, we encounter one who produces something beautiful that remains. (1) Gretchen Reynolds, “One Minute of All-Out Exercise May Have Benefits of 45 Minutes of Moderate Exertion,” The New York Times Blog, April 27, 2016, Accessed 20 May 2016. (3) As cited by Timothy Egan in “The One Minute Life,” The New York Times, May 13, 2016, Accessed 20 May 2016. (4) As cited in Clint Brown, Artist to Artist: Inspiration & Advice from Artists Past & Present (Corvalis, OR: Jackson Creek Publishers, 1998), 87. This entry was posted in Readings & Devotions, Uncategorized and tagged abide, abiding, art, article, devotion, manning, Margaret, ravi, rzim, shull, slice of infinity by totaldevotionmbcla. Bookmark the permalink.